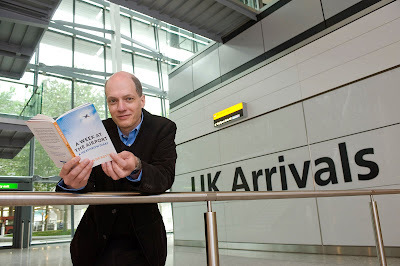 Pop philosopher Alain de Botton, shown at Heathrow Airport flacking his 2009 book, A Week at the Airport. Photo from Frank Bures.com. Pop philosopher Alain de Botton is undeniably entertaining. He talks a mile a minute, spewing forth an impressive array of insightful ideas and wry humor peppered with staccato interjections, the effect of which is to mesmerize his audience into uncritical adulation. You can see his performance at a recent TED conference here. De Botton’s best outcome is to provoke the listener -- or reader, as he has written several books -- to entertain new ideas. His worst is to encourage us to treat these ideas as mere baubles, fascinating to contemplate for a while but without lasting effect. De Botton appears to be of that class of philosophers who make trenchant observations about life and the world rather than those who think analytically and step by step. In this, he resembles Nietzsche, not Descartes. Nor is he a grand synthesizer in the tradition of Aristotle, Aquinas, or Whitehead. What he really is is a modern-day sophist. Sophistry has a bad name, largely because Plato and others portrayed the sophists as fallacious reasoners more interested in rhetorical persuasion than truth. The Greek word sophos or sophia originally meant wisdom, or more specifically expertise in a particular domain such as shipbuilding or sculpture. It came to mean wisdom in human affairs generally; and by the time of Socrates, in the second half of the fifth century BC, the term “sophist” meant a teacher who used the tools of philosophy and rhetoric to teach the skills of public discourse to young noblemen. The goal was to train them to prevail in public argument, a skill critical to success in the contentious social life of Athens. And the best of the sophists commanded a very high price for their work. By proclaiming that they taught excellence in general, not merely skills in rhetoric, they earned the scorn of Plato, who portrayed them in several of his dialogues as not really knowing what they were talking about. But at their best they really did teach people some important things about life. De Botton is a victim of ideology, the normative sense of reality produced by our culture without our quite realizing it. Social discourse tells us what is real, and our perception of reality depends as much on that discourse as it does on our senses. More specifically, ideology is a set of ideas espoused by the dominant class of society, who tell the rest of us how the world is and should be. The social discourse, the way we all frame our questions and discussions about life, the world and the economy, assumes that the economic interests of the dominant class are the economic interests of the entire society. At a deeper level, ideology tells us that the question of what a successful economy might look like is irrelevant to our own career. It tells us that the important question is how to get the best work out of someone, and de Botton’s answer is to be like a firm but loving dad. (And note that his answer is directed to managers, who have careers, not to workers, who have jobs.) No doubt that is good advice as far as it goes, but it does not address the question. If you are a firm but loving manager in a company that is polluting the environment or lobbying lawmakers for anti-competitive special treatment or hiding evidence that your products are dangerous or moving jobs off-shore to the detriment of the local community, then you may be doing a good job within the context of your employment, but you are not addressing the greater good. An economy that fosters such behavior is not a success for the majority of us. And even within that context your own career may not be secure. There have been numerous instances of middle managers getting told to sack their employees and then, having done that dirty work, been given the boot themselves. The dominant ideology tells us that free trade is of such a preeminent value that we should not be concerned about the environmental impact of how goods are made or the social impact of how the workers who produce those goods are treated.